Short amino acid chains or peptides play key roles in many biological functions. Peptides from antigens are responsible for immune responses. Many biologically secreted and synthetic peptides have been used or being developed as drugs in various therapeutic areas including treatment of infection, cancer, diabetes, and cardiovascular diseases. The MicroMolar Peptide Assay Kit (Catalog number PEP200) is designed for concentration measurement of various peptides. The assay is based on increase of fluorescence at 535 nm of the dye C57 in the presence of peptides. The assay kit can be used for measurements peptide concentrations in synthetic or biochemical reactions, pharmaceutical products and environmental water samples. The MicroMolar Peptide Assay Kit (catalog number PEP200) provides the reagent for measurement of 200 samples using 96-well plates. Cuvettes may also be used for measurements. 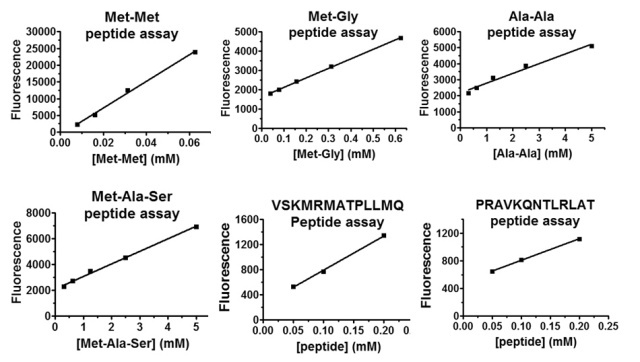 The assay sensitivity varies from micromolar to millimolar concentrations depending on the nature of peptides. The assay is compatible with HEPES buffer, low concentrations of non-ionic detergent (<0.01%), MgCl2 (< 5 mM), CaCl2 (<5 mM), EDTA (< 1 mM) and phosphate (< 1 mM). It is not compatible with thiol compounds such as DTT.